Reddit… The little martian with beady red eyes is the not so hidden gem that you haven’t really known what to do with. Internet marketers, bloggers, website owners.. regardless of the category that you’d call home, Reddit simply cannot be ignored. It is currently one of the largest 25 websites in the "world". We’re talking over 200 million unique visitors and 8 billion (yes billion) pageviews “per month”. Specifically, in the US, it is currently listed at #9. Neil Patel wrote an impressive post on Reddit which was quite detailed as well and at the time of his article, Alexa (a website that tracks traffic data on every website online) had it listed at the 30th website in the world and ranked at #10 and this was only a little over a year ago when Neil wrote his detailed post about Reddit. That is massive growth amongst the big boys at the top of the mountain. What are they feeding this website.. Seriously, I want the vitamins they’re feeding Reddit.com for my own blog. With that said, while you could go to Alexa and certainly search it out for yourself, the current image depicts what I have stated above with respect to how impressive this website has become according to Alexa since it's debut over a decade ago. While conceptually the idea behind this website and how it operates isn’t entirely unique, this website is indeed "very unique" in it’s sheer power which is great for those that want more exposure online. Neil Patel points out that Reddit does make it’s website traffic statistics public and it actually does just in case there are skeptics out there. So for those of you wondering, well what kind of advertising power and potential could you hope for. Your answers are here, as seen in the images below. So lets talk numbers and this is what is being reported at the time of this post. and each data source includes [day, unique visitors, pageviews and even subscriptions in the traffic by day analysis]. 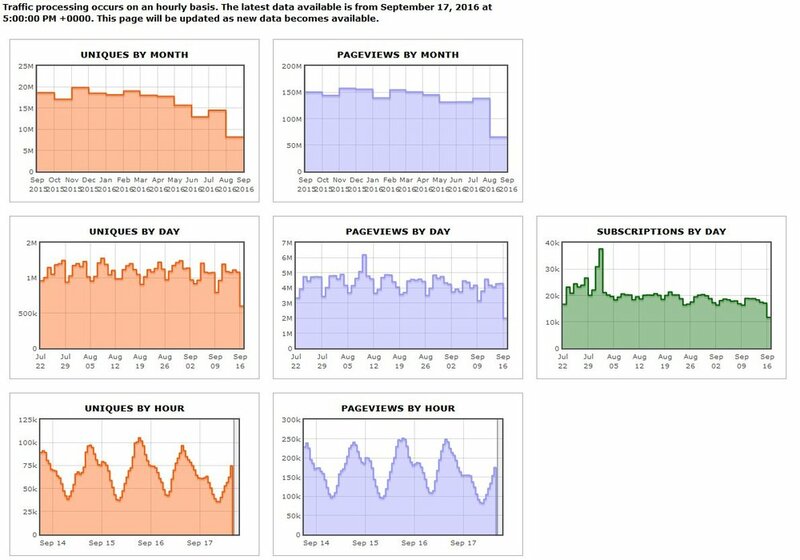 What I really enjoy about Reddit’s traffic data transparency is that they clearly state the processing is done on an hourly basis each day and that as the new information becomes available that data in turns becomes available for you as a visitor, member, fan or potential customer of their ad platform service. With that said, lets face it there are a lot of different advertising platforms for internet marketers, website owners and bloggers alike to choose from to increase their presence online. For those of us that have been online for any decent amount of time, we’ve all had varying experiences when it comes to advertising but I stand firm in saying that Reddit is legendary. Sheer user engagement alone stands apart from most other advertising platforms. I say that because “faking” Reddit is hard to do and it’s likely to be your websites online suicide as well not to mention your brands reputation too. If there’s a platform out there that exists today, particularly one of Reddit’s size, being real, genuine and a botless community is something that you will be hard pressed to find elsewhere and there are stories beyond stories of how people have tried and have failed miserably. The point that I’m making is that with respect to your ROI and investing in an ad platform that provides a greater degree of success for you when compared to others that are as large if not larger, Reddit simply cannot be ignored. Needless to say, with exciting claims and testimony and not to mention having captured the attention of Newsweek too, why wouldn’t you want to investigate the opportunity to get a piece of the advertising pie here ? Beyond what’s been stated you can also target by keyword and geography to drive engagement and awareness of your website or brand. 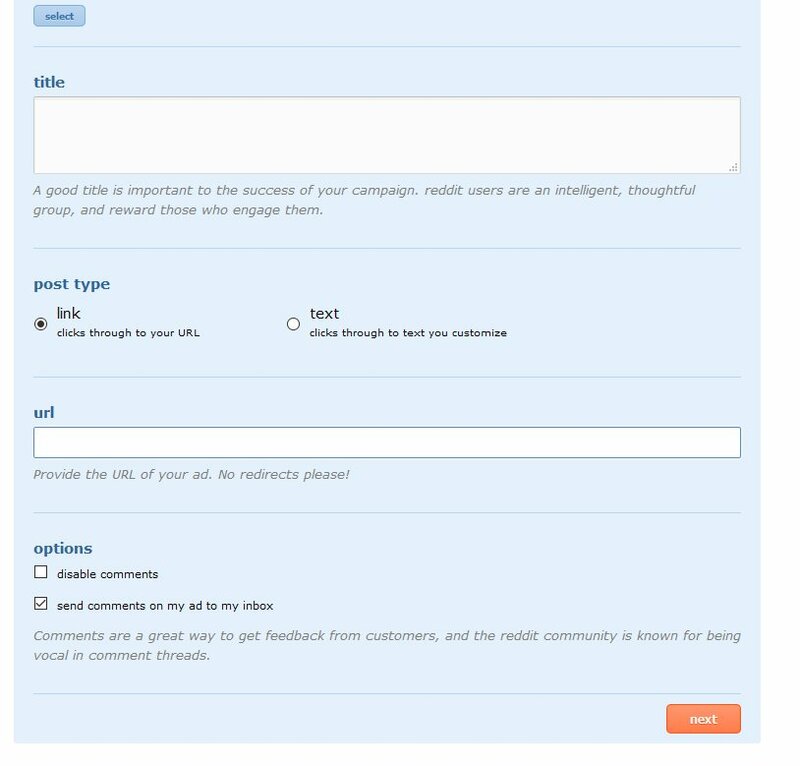 With that said, navigating to this page: [https://www.reddit.com/advertising] as seen below will be your first step in advertising with Reddit. After you’ve done your work there, then you’ll be taken to your creative dashboard. The dashboard will allow you to edit your “creative” which is just ad speak for your newly created ad. This is where you'll put the finishing touches on your ad and truly make it ready for the paid promotion. You will need to decide on your targeting. You have the option to target similar collections that would match well with your ad or target a specific subreddit. You also have the option to decide on location whether you want to target the United States or another country. If you think that your ad will perform better on desktops, then select desktop as your option. Alternatively, if you believe that it will perform better for mobile then select that option and if it doesn’t matter then selecting all platforms is the best avenue to take. Next, it’s time to talk about budget. Yes, you knew that was coming. I kind of gave it away in the last image but lets talk about it anyway. Reddit is not a high cost ad platform which makes it even more appealing because it caters to those with the smallest of budgets to those individuals or corporations that have high ad dollar campaigns to run. Reddit advertising allows you to set your CPM (cost per mile or 1000 impressions) as incredibly low as .20 and they won’t go lower than that per 1000 impressions. So lets give you a bit of perspective here.. you could get 5000 impressions for a measly $1.00. Imagine if you could convert even 5% of those impressions into clickthroughs to your site and potentially into sales ? Reddit’s ad platform is truly a powerful medium for anyone seeking more online exposure which is basically ALL of us. So add this legendary ad platform to your traffic strategy and explore what it can do for your traffic as you compete in your respective niches to improve your brand awareness and visibility online. It's not new news that Reddit, an online social platform is great for driving traffic to your website, "especially" if you can get yourself "upvoted" to the front page. Getting upvoted to page one on Reddit is quite simply the holy grail. Expect nothing less than a MASSIVE boost in website traffic if you find yourself one of the lucky ones to reach such a feat. I won't go into the specifics about how to use Reddit, but I will say that it intensely frowns upon manipulation of any kind of their voting system and they have a real disdain for online marketing and self promotion for SEO benefit(s). Lets just say "hypothetically" that you're desperate for traffic as most people trying to develop a presence online truly are.. and want a quick route to getting the most votes you can on articles you submit to their system thinking that buying votes or trying to get votes faster is a great idea.. Understand, many before you have probably tried and many have failed and Reddit employs consequences that'll make anyone think twice about trying to game the system. CBS's interative OnGamers website received it's "second" ban for it's attempt to manipulate the Reddit system. The specifics are that Rod Breslau (senior editor at OnGamer) had been sending messages to Reddit users asking them to post content for him and then he would go back and upvote the content himself obviously with the goal in mind of trying to get more traffic to the CBS gaming website. Apparently since the social platform accounts for half of the OnGamers website traffic, the tactic must have been working, but everything changed once the manipulation had been discovered. OnGamers lost half of their traffic overnight ! Reddit has now employed at MINIMUM.. a year long ban and Mr. Breslau has been fired. There are massive benefits to using Reddit when used properly and within their guidelines. Like any other social platform, it's about contributions of information that is valuable to it's base and participation in the community. Attempts to game any system are short term benefits and always long term losses. The best advice that I can give is to continue to use social media, but understand that it is still an asset that you don't control and you should spread your traffic generation strategies amongst "several" options and not just one as we have seen in this example.